Mom's Gone Bronson! : DaVinci Gourmet Syrup Review! YUMMY! 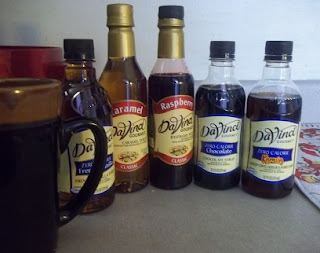 There is something delicious about a nice hot cup of tea or coffee with a splash of the right flavor syrup to perk up your pallet and this past couple of weeks my mouth has been dancing to the many tasty syrups straight from DaVinci Gourmet! For over a decade, DaVinci Gourmet has been bringing sensational flavor to the waiting public and satisfying a sweet tooth across the board with its wide range of unique flavors of which I had the absolute pleasure to try over the last week or so! Some of the flavors I have personally tried have included: Classic Caramel, Classic Raspberry, Zero Calorie Chocolate, Zero Calorie Vanilla and Zero Calorie Kahlua! I have always loved a coffee with a little extra pop and so these syrups really put the twist I want into my beverage of choice - even tea tastes wonderful with a little flavor so why not! I particularly love the taste of Classic Raspberry in tea and the Zero Calorie Kahlua tastes just amazing in a nice, hot cup of milky coffee! There is no yucky after taste, which I have found with some other syrups and they are not overly sweet if you use the right amount! The taste is exactly what you would expect from a quality product and you don't have to limit your use of these to tea or coffee alone! Think about using them in some of your sweet treats and iced favorites! I have certainly not been disappointed at all! For a list of available flavors, you can hop on over and visit DaVinci Gourmet HERE and then check out their FAQ for a full list of stores, coffee shops and outlets where you can pick up your syrups of choice! Available in over 40 countries world wide, see if there is one available near you, today! Disclaimer: I was provided with several flavored syrups in order to write this review! I was not otherwise at all compensated for my view. All opinions are honest and my own and, as every, your opinions on the product may differ! Thank you! I love the caramel syrup!yummy!!! I have never tried these but they sound yummy!